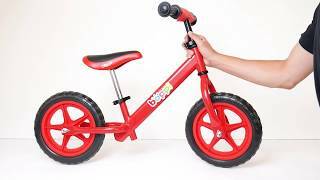 The boppi Metal Balance Bike is perfectly designed to help your child learn to ride. There are no pedals – simply by sitting on the comfy seat and making a walking action they will be able to move the bike, building confidence and balance in a safe, fun way. The bikes are made from lightweight steel, with soft handlebars, a padded seat and puncture proof tyres. Quick release clamps allow the bike to grow with your child and also remove the need for tools while setting up. The boppi Metal Balance Bike is ideal for ages 2 to 5 years, and is light enough to comfortably carry if your child gets tired!